Obituary for Robert E. Fretz | Schrock-Hogan Funeral Home & Cremation Services, Inc.
Robert E. Fretz, Sr., 85 of Speers Hill, passed away Monday, April 8, 2019 in his home. He was born April 28, 1933 in Fairhope, the son of the late Percy and Martha (Hency) Fretz. Bob served in the US Army during the Korean Conflict. He was a greeter at the Community Baptist Church of Charleroi, delivered meals on wheels until his health declined. Bob was a member and past master 1983 and 1998 with the Henry M. Phillips F. & A. M. Lodge 337 in Monongahela. He was also a member of the Scottish Rites of Pittsburgh 32nd degree mason. Bob retired from the USX Steel Co., Clairton Plant. 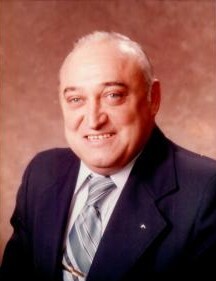 He is survived by his wife Irma Henry Fretz who would of celebrated their 65th wedding anniversary on April 25, 2019; two daughters Linda Copeland and husband Kevin of Speers Hill and Lori Savko and husband Dean of Monessen and his son Robert Fretz, Jr. and wife Janice of Fallowfield Township; three grandchildren Jessica Taylor and husband Chris, Jerad Fretz and Michael Copeland; three great grandchildren Alayna, Lucas and Logan Taylor; two sisters Karen Fretz and Shirley Pelkey and nieces and nephews. In addition to his parents Bob is preceded in death by two infant grandsons Robert Fretz III and Justin Fretz, a sister Geraldine Parish and a brother William Fretz, and a loving aunt and uncle Lloyd and Bertha Haywood and aunt Mary Hoyes Brown. Friends will be received Thursday from 2 to 4 and 6 to 8p.m. in the Schrock-Hogan Funeral Home & Cremation Services, Inc., 226 Fallowfield Ave., Charleroi. Funeral services will be held on Friday at 11a.m. in the funeral home with Pastor Kevin Roberts officiating. Interment will follow in the Mon Valley Memorial Park. A masonic service will be held by the Henry M. Phillips F. & A. M. Lodge 337 at 7 p.m. in the funeral home. Online condolences may be sent to the family at www.schrock-hogan.com.